I’m an animation junkie; I love watching old Disney movies over and over, and whenever Pixar releases a new movie, you can bet I’ll be there opening day. But other than Pixar, I’m less than impressed (to put it lightly) with the state of animation today. There’s a horrible animated movie coming out every few weeks, and one of the main offenders is DreamWorks animation. Oh boy do I hate DreamWorks animation. The company’s only good movie is the original Shrek (maybe Madagascar); the rest are awful: Shrek 2 and 3, Over the Hedge, Shark Tale, etc. The main problem is a lack of creativity, too much emphasis on an all-star voice cast, and too many pop culture references. They don’t understand what animation is all about. Well I don’t know what happened or who got put in charge, but Kung Fu Panda takes all their other films, roles them into a ball and throws it across the room. 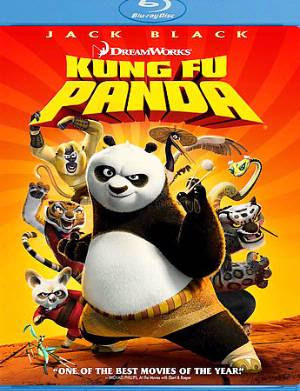 As an animation junkie, Kung Fu Panda was one of the most entertaining times I’ve had at the movies all year. It has every element a good animated movie needs, the elements established by Walt Disney 70 years ago. Po the Panda works in his father’s (his father is a bird, which is a sort of subtle running gag) noodle restaurant, but his real passion is Kung Fu. One day, the Kung Fu master in the village Po lives in, Shifu, learns that the evil tiger, Tai Lung is going to escape from prison and that they must find the legendary “dragon warrior” in order to stop him. During the ceremony when the dragon warrior will be discovered, Po drops in from the sky (he’s attempting to get into the ceremony because he arrived late) and is accidentally chosen as the dragon warrior. I said this movie has every element that goes into making a great animated film, and it’s very true. One thing every great family film needs is a protagonist we can all root for, and Po is the epitome of this kind of character. Po is very loveable; he’s lazy about things he dislikes (noodles, waiting tables) but very enthusiastic for that which he loves (kung fu, eating, friends, etc.) He’s a nice guy, and would never think of being mean to anyone. He’s loveable, and a hero we love to root for. Jack Black voices the character, but it’s hard to tell. Unlike his live action performances, where Black screams and jumps around like a madman, he shows plenty of restraint in this voice role and breaths great life into Po. The plot, which I described above, is simple; very simple, and extremely familiar too. Plot-wise, the film breaks no new ground, but the film executes its plot in such a fresh and creative way that the film feels very original. The film’s message, that there’s a hero inside all of us, is one of the oldest and most used family-film messages, but they drive it home particularly well here. Few animated films today tie their plots and subplots together as well as Kung Fu Panda; small elements, such as the secret ingredient in Po’s dad’s noodle soup, seem inconsequential at first, but come together at the end to drive the message home. It’s really cool, in the end, to see everything tie together to create an amazingly satisfying conclusion. There haven’t been very many live action films this year that have put together such a great story. It never insults your intelligence as an adult, and is plenty simplistic for kids. Masterful, to say the least. A great supporting cast is also essential to telling an animated story well, and Kung Fu Panda has no shortage of great characters. Shifu, the Kung Fu master is wise and gruff, but lightens up over time. He is voiced by Dustin Hoffman, who perfectly fits the part. His five students, Tigress (Angelina Jolie), Monkey (Jackie Chan himself, though he doesn’t have any lines that I can remember…), Viper (Lucy Liu), Mantis (Seth Rogen), and Crane (David Cross) are voiced well and are great side-characters, who all change as the story develops. That’s something I really love about this movie; Po isn’t the only one to go on a journey of character; all the character’s become better for the experience. What else does a great animated film need…well, stellar animation, obviously. Animated in an aspect ratio of 2.4:1, the film has 100 times the visual flair of every other DreamWorks animated film so far. Each shot is a thing of beauty; the landscapes are lush and detailed, but never become too realistic; this film exists in a world similar to ours, but different too. The animals are the same way; they closely resemble their real life counterparts, but are never too realistic. Animation should never aim to be too realistic, and Kung Fu Panda follows this guideline. Animation should draw the viewer into a fantastical world and immerse the viewer in that world so much that they forget they are watching animation; Kung Fu Panda succeeds in this. All the elements come together to form an animated film that can only be described as classic. The movie has lots of heart, and the story and characters are enthralling. The action is exciting, and the animation is beautiful. This is a perfect animated film, perfectly paced at a brisk but extremely enjoyable 90 minutes. This was one of the best films of the summer, and in November, it still ranks among the year’s best. A CGI film is created completely in the digital world, meaning no film was used at any point from the film’s creation to its transfer to Blu-Ray. Thus, this is a virtually flawless transfer, a reference quality HD image. The film makes great use of colors, and this is an image that shows off how colorful HD can be. Every color, bright or dark, simply leaps off the screen, vibrant and strong. These are the kinds of colors you can’t get from DVD. Detail is also amazing; you can see every single hair on Master Shifu or Tai-Lung, and every crack or dent in a wall. The CGI animation is very detailed, and its fun just to look at all the detail in the HD image. The sound is also quite good. The music sounds rich and has a nice kick to it, while sound effects really have a nice “oomph.” In the “dumpling fight” scene, the whoosh of the chopsticks sounds like it’s actually happening in your living room. I bet you could even make kids understand the importance of HD with this A/V experience. Since the film was released by Paramount, you can expect the Kung Fu Panda Blu-Ray to be excellent in all areas. We’ve talked about video and audio, leaving only the extras, which, while not entirely comprehensive, are vast, diverse, and most importantly, entertaining. They’re primarily aimed at kids, but the extras are still pretty fun for adults. The extras are broken into categories. The first, Inside Kung Fu Panda, starts with a Filmmaker’s Commentary by the directors. I didn’t get a chance to listen to it, because on my disc, the sound on the commentary had an annoying hiss and crackling sound, whether I put it through my TV speakers or my external speakers. I don’t know if anyone else is having a problem with this, but it made the commentary unlistenable for me. The second feature, Trivia Track, is a simple, informative, and interesting trivia track that should educated both kids and adults. The third feature also plays with the movie; it’s a Picture-in-Picture Commentary that shows interviews, pre-viz animation, actors voicing lines, etc. Problem is, the sound won’t play on my disc. At all. This feature makes no noise, rendering it useless. I don’t know if anyone else has this issue, but I can’t comment on what was probably the best feature of the disc. Meet the Cast (13:18) is a fluffy marketing piece made before the film’s release, but you do get to see actors voicing lines, which is pretty cool. Pushing the Boundaries (7:07) is an interesting featurette about the groundbreaking animation. Conservation International: Help Save Wild Pandas (2:00) is a PSA with Jack Black, at his most annoying. Seriously, this PSA is unwatchable due to Black’s entire demeanor. It’s…grating. The next section is Po’s Power Play, featuring games and activities. The first is Dragon Warrior Training Academy, an interactive game that is boring and glitchy, but that kids might enjoy. Dumpling Shuffle is a simple but fun game where you have to keep track of the moving dumpling. Learn to Draw features 6 videos teaching you how to draw 6 characters…by hand. You would need a super-advanced computer and terabytes of hard drive space to animate CGI models. The third section is The Sounds and Moves of Kung Fu. First is Sound Design (3:54), a short but informative piece on the sound design. “Kung Fu Fighting” Music Video by Cee-Lo (2:19) is a music video of the re-written Kung Fu Fighting song from the closing credits. Learn the Panda Dance (4:32) is a silly video teaching kids the titular panda dance that apparently appears somewhere in the movie (though I fail to see where). Do You Kung Fu? is superfluous but fun collection of videos teaching various methods of Kung-Fu. The fourth section, Land of the Panda, opens with a very neat video called Mr. Ping’s Noodle House (4:43) where the host of Iron Chef America shows us how professionals make noodles. It’s very cool. How to Use Chopsticks (2:55) teaches you…well, guess. Inside the Chinese Zodiac is an interactive feature where you find your place in the Zodiac, learning what animal you are and what traits come with it. This is actually pretty fun. Animals of Kung Fu Panda (6:18) is a conglomerate of the videos from Do You Kung Fu, and works better in this concise form. What Fighting Style Are You? is a personality quiz where players see what animal of the ferocious five they are most like. Finally, there’s the DreamWorks Animation Video Jukebox, featuring a musical number from each DreamWorks animated film. The best part is seeing a clip from Shrek in HD. Two trailers for upcoming films are also present, along with BD-Live features. Overall, the extras are entertaining, but nothing to get excited about. As per usual with Paramount, they are all in HD, which really enhances the experience. Kung Fu Panda is an instant classic and one of the best films of the year. The Blu-Ray offers one of the best images I’ve seen on the format, along with a healthy dose of fun extras. It comes highly recommended.